The millennial’s debate that enrages us all: when do you really know if the avocado is ripe or not? Though attaining the status as an ‘exotic fruit’, avocado can be purchased in places like Nature’s Basket and Food Hall. Luckily enough Mumbaikars, we’ve decided to round up our guide to best avocado dishes in town – so all you have to do is step out and enjoy the ripeness. If you’re in the mood for some delicious prawns and avocado guacamole, then Woodside Inn at Colaba is the one for you. The bruschetta with creole prawns, guacamole, black olives crispy tomatoes skin topped with watermelon pickled is for the prawn lover who loves their avocados fresh and out there. This delicious and healthy sushi dish is perfect for the avocado lover. It’s a vegetarian sushi, made with fresh avocado, pickled carrot and a side of spicy sauce to hit the right taste. An indulgent breakfast item for the soul, there’s smashed avocado, homemade organic cashew cheese on their organic whole grain oat flour and their gluten-free buckwheat bread. With a freshly brewed glass of their organic smoothie, we really enjoyed the avocado flavours. Crostini is a small bite bread, which is generally topped with a choice of fresh toppings. At Asilo, you’ll find avocado crostini and with cream cheese and chilli orange drizzle. Of course, being a five star restaurant, it’ll burn a hole, so go here post salary days. It’s simple and clean. It happened In New York has a dedicated clean eating section, and this dish tops the list. 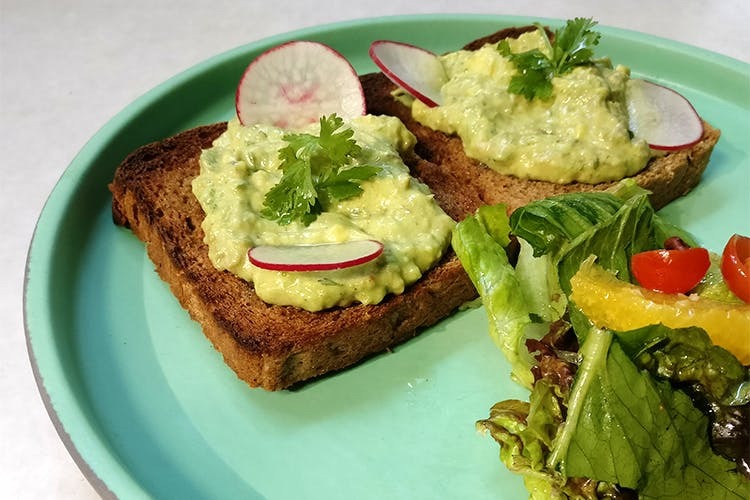 There’s creamed fresh avocado on rye toast, with pickled baby radish, a perfect dish for those brunching days. This all vegetarian Italian place is a delightful, for the vegetarians and non-vegetarians. And this is where we found the gem of avocado variation, grilled corn cakes topped with sour cream and spicy guacamole aka avocado sauce.